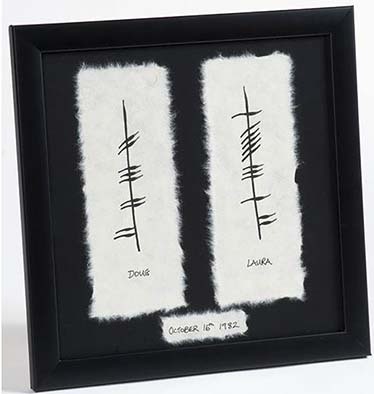 A personalized hand-painted Ogham artwork makes the perfect Irish wedding gift! Ogham pieces, especially personalized Ogham works, have become very popular gift items, and I have therefore decided to provide a little Ogham history. First and foremost, however, is a quick lesson in how to pronounce the word. “Ogham” is pronounced “Ohm,” not “Og-ham,” as you might assume. Now that we’ve gotten that out of the way, Ogham is an alphabet, not a language, and is the earliest known form of writing in Ireland. The etymology of the word Ogham remains unclear. One possible origin is from the Irish og-úaim, “point-seam,” referring to the seam made by the point of a sharp weapon. 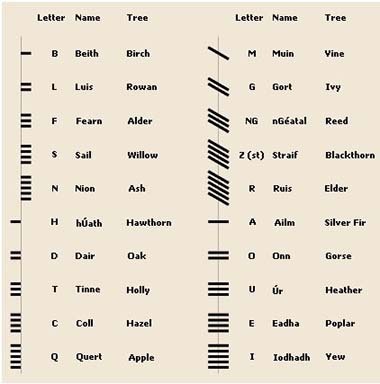 The earliest inscriptions in Ogham date to the fourth century, but some contend the alphabet dates to as early as the first century BC. There are two main schools of thought among scholars as to the motivation for the creation of Ogham. Some scholars suggest that Ogham was first created as a cryptic alphabet, designed by the Irish so as not to be understood by those with knowledge of the Latin alphabet. In other words, it was created by the Irish for political, military, or religious reasons, to provide a secret means of communication in opposition to the authorities of Roman Britain. 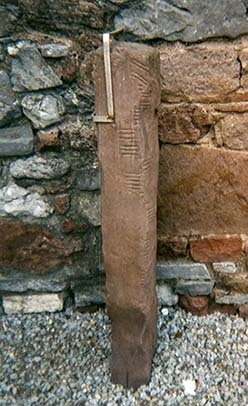 The second main school of thought is that Ogham was invented by the first Christian communities in early Ireland, out of a desire to have a unique alphabet for writing short messages and inscriptions in the Irish language. The argument is that the sounds of primitive Irish were regarded as difficult to transcribe into the Latin alphabet, so the invention of a separate alphabet was deemed appropriate. In either case, the alphabet consists of 20 linear characters, read from bottom upward. The characters of the alphabet were named after trees and plants. Originally, Ogham was inscribed on standing stones, carved into the edge of the stone. Roughly 380 of these standing stones have been discovered, with the highest concentration of them found in the southwestern part of the country, mainly County Kerry. www.EverIrishGifts.com offers a large collection of hand-painted Ogham items, any of which can be personalized for that perfect Irish birth, birthday, wedding, or anniversary gift.